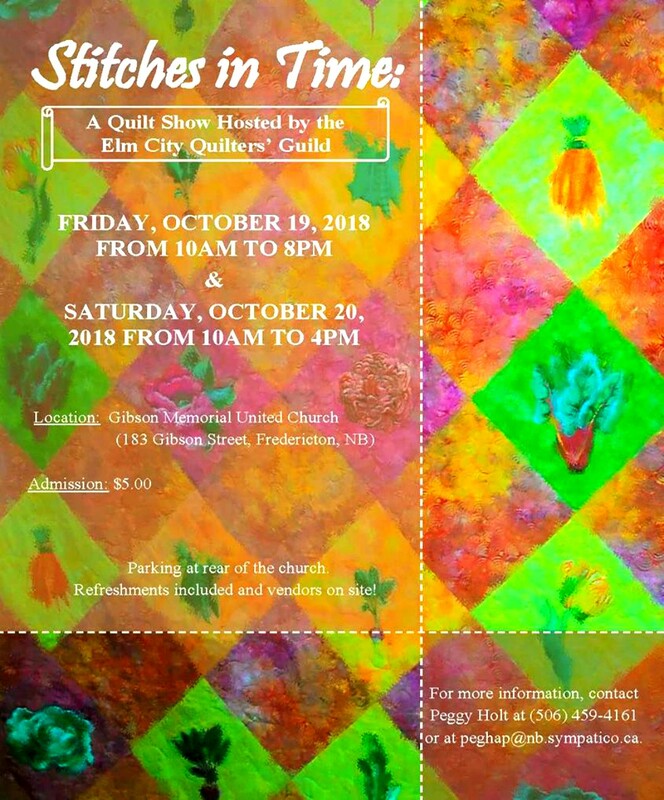 Stitches in Time, a fall quilt show by the Elm City Quilters’ Guild, is at Gibson Memorial Church, 183 Gibson Street, Fredericton, New Brunswick. The show is taking place Friday, October 19 from 10 am – 8 pm and Saturday, October 20 from 10 am – 4 pm. Projects on display include quilts, bags, wall hangings, small pieces of furniture with quilted tops, ironing board covers, etc. There will be a well-stocked tea room. There will be vendors and giveaways! Admission is $5, payable at the door. Parking is at the rear of the building. This is a syndicated post. You can view the original post here: Stitches In Time: A Quilt Show. ← WELCOME TO WILD FLOURS SWEETS AND TREATS!